Beautiful day, sunny and cool. The cottonwoods are turning yellow now, replacing the maples whose leaves have mostly fallen. I was planning to get started on the Half Fanatics profile page and go for a bike ride but Pat called around 9AM to say he was going out to Studebaker Creek with Dan Brown and did I want to come. Having never been there before, and curious also about what Dan might know about the closure of Lucas Creek, I decided to go. Apparently Weyerhauser has closed both Lucas Creek and Ceres Creek to agate hunting because of people digging in the streams. I drove down to Pat's, picked him up and continued down to exit 49 where we met Dan at the Shell station. We drove east on Hwy 504 to Toutle, south on Sightly Road then right on Canal Rd briefly, then left on Moore Rd to near its end where a gated logging road turns off to the left. I'd been there before, when the boys and I hiked up Hemlock Creek a few years ago. The gate was open now. We followed Dan in across the railroad tracks, turned left then continued past two spur roads to the left. About two miles in we cut sharply back to the left on the third spur road, drove in about a third of a mile on a rocky track and parked. A trail leads through the woods on the left a short distance, maybe 50 yards, to diggings in a marshy area of young cottonwoods and brush. People have been digging there for several years and there are pits everywhere which are usually full of water but today were mostly merely muddy. Rough fragments of yellow to orange agate and some variously-colored jasper are abundant in a clay layer 1-3 feet or more below the surface. Most pieces of any size (occasionally 2-4", infrequently twice that) are filled with quartz of the same color, pretty un-distinctive stuff though nice pieces of banded agate with deeper color show up occasionally. In three hours, working a couple of the existing holes, I dug about 30 pounds of of agate and maybe 10 pounds of leaverite (as in "leave 'er right there"). I didn't see any sign of the creek; turns out it is about a half mile back to the SE, not far from where we turned left onto the third spur road. On the way home I ate supper with Pat and Shirley. Afterwards they sent me off with 3 half-gallons of grape juice from their grapes and about 10 pounds of mostly ripe tomatoes from their garden. I kept awake on the drive back by shouting at myself and was hoarse when I got home. Enjoyed a great morning ride in a stiff but warm southerly breeze with dramatic clouds overhead then did little the rest of the day, a consequence of too little sleep last night. Ran during the break, including 5 miles barefoot on mostly dry pavement. The rain returned just 15 minutes after I finished running. In the morning I perused websites to get ideas on style and layout using the Wind River Range as a subject for my search. In so doing I ran across Peggy Abbott's ecotourism company Naturalist Journeys LLC. I "dated" her briefly the year after I graduated from college and haven't heard anything about her since - nice to see that she's done well. David, Nick and I drove down to Westport today to see the surf. The NOAA online weather site warned of swells 25-30' high last night along the Oregon and Washington coasts, diminishing to about 20' by Sunday afternoon. We decided on Westport after considering Cape Disappointment where the waves would have been larger, but we left too late and weren't really up for that long a drive anyhow. The waves at Westport, having already crossed the bar and entered the bay, were no longer 25' high but they were still impressive. As we drove up they were crashing over the breakwater and sending sheets of foamy water flooding down the streets. The breakwater is a wall of dark basalt boulders 2-4' in diameter piled up about 8' high all along the north end of town and east around the point over to the marina. A paved walkway runs parallel to the breakwater west about a quarter mile from a viewing tower out to a long sandy beach. The path is separated from the breakwater by a low ridge of dune grass as it approaches the beach but in town only a flat area of sand and rubble lies between the breakwater and the tower, which in turn stands at the north end of the main street along the big marina fronting the town. We parked near the breakwater one or two streets west of the tower, perhaps not the best choice since within 15 minutes after we arrived our car was standing in a shallow lake of salt water. Fortunately that drained mostly away by the time we wanted to get back to the car. Note the person on the path at the far right side of the above series of photos We hiked up onto the dune grass hill to where we could see over the breakwater and marvel at the big breakers rolling in. We were thrilled by the sound and sight of the huge waves and by the prospect that every now and then one of them would blast a flood of salt spray over the wall and onto the hill where we stood. The waves to watch for were those that waited to break until they were just on the other side of the wall from us. We managed to elude a soaking but we watched several nearby spectators get doused, even down on the path. 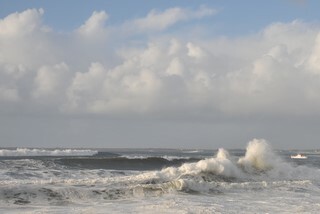 The big ones came in sets of three or four alternating with half a dozen smaller swells. Sometimes the larger waves would all break while they were still a quarter mile or more from shore, walls of tumbling white water six or eight feet high on top of parallel ridges of gray-green water. By comparing the waves with a couple of Coast Guard boats practicing rough water techniques offshore we estimated the larger waves to be at least 15' high, over the heads of the crewmembers crowded on the superstructure of their boats 10' or more above the water. Several times we lost sight of the boats entirely when they dropped into troughs between the waves. They were big boats too, maybe as much as 50' long and 20' tall. They took most of the waves head on and would rear up at a 30-40 degree angle off the crest of a breaking wave before crashing down on the back side. As the waves approached the wall of boulders they would mount up into a concave wall of foamy water almost high enough to obscure the horizon before crashing down with a rumbling roar that seemed to reverberate inside us. David and I tried to take pictures without getting too much salt spray on our cameras. The trick was to wait for the spray from the last wave to blow past, then pull the camera out from the folds of our rain gear, snap a quick picture or two then tuck the camera away again just ahead of the shower of spray from the next wave. Hopefully during those few seconds that wave would be putting on a good show. The waves were coming in at a bit of an angle so the blast of whitewater and spray would start near the tower and explode progressively up the breakwater towards where we stood. away with just a bump on his forehead, considering he fell six feet or more onto rough boulders when the wave swept him off the wall. We ate an early supper at Los Arcos on the cross street by the supermarket where the patrol car is parked with a dummy officer, complete with sunglasses, inside. The relleno was oily and the burrito not much better - for the most part not nearly as good as I remembered from last summer though the pico de gallo was perhaps the best I've ever tasted. I kept awake by listening to Replay during the long, dark and wet drive home. After tying my brain in knots for most of the morning trying to get my divs and spans to work the way I want them to on the Half Fanatics pages (finally working on the new Profile page), I decided to take the canoe over to Tacoma and see if I could find the Black-tailed Gull. It's been roosting with a big flock of other gulls, mostly Mew and Bonaparte's with a few California, Glaucous-winged and Western gulls thrown in, on a log boom off Marine Shore Drive at the NE 5000 block, about 0.3 miles SE of the Tyee Marina. I spent the last hour or two of daylight after delivering the boys back to school yesterday afternoon scoping the gull flock but was unable to pick it out. Today I had more success with the bird, though not so much with the canoe. A birder from northern California, Gary Bloomfield, already had the bird in his scope and graciously shared his view with me. Not great light but I was able to see the black tail, the gray mantle slightly darker than the adjacent Mew Gulls, the dark wingtips with small terminal white spots on the last few primaries, the yellowish legs and whitish head with dusky streaked nape. Only the black tail decisively distinguished our target from the similar-sized California Gulls nearby. At our distance we couldn't quite make out the pale eye or the red and black on the tip of the bill. 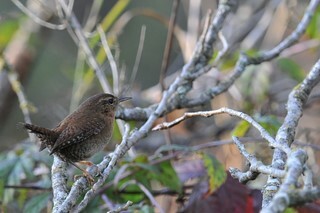 The slightly darker mantle and the reduced white in the wingtips would also distinguish the Black-tailed from an adult California, but a 3rd cycle California has variable terminal black on the tail and minimal white in the wingtips. However, the gull we saw had a broad subterminal black band across the tail and much less contrast between the black wingtips and the gray wings than would be shown by a 3rd cycle California Gull. So despite Gary's questions, I think we saw the Black-tailed. Having not used the canoe in a few years I felt quite adventurous taking it out today, particularly since a brisk southwest breeze made conditions a bit challenging. Gary helped me get it down the bank and I set out to try for a closer look at the gull. I found it difficult to turn the canoe into the wind from my solo paddling position kneeling in the center of the boat; I realized later that I should have been kneeling in front of rather than behind the center thwart. Once I rounded the corner of the log boom I was exposed to the incoming chop which, though barely noticeable from shore, was high enough to come within an inch or two of the gunwales. The wind was stronger too and the only way I was able to make upwind progress was to turn around and paddle backwards. It was, of course, difficult to watch the gulls when my back was towards them, and in any case the canoe was too unstable to permit studying the gulls for more than a second or two at a time. I couldn't even think about getting out my camera; the moment I stopped paddling the canoe would swing around and begin drifting swiftly away from the log boom. Tacking backwards back and forth near the gulls I wasn't able to spot the Black-tailed Gull until I inadvertently swung too close and flushed them. I did see it then, had a clear view of its back and tail in flight. Small white terminal spots on outer primaries, broad band of black in the tail, minimal contrast between wingtips and mantle. I still didn't get a good look at the eye and bill though. I'd had enough and paddled back to shore; I'll try again on a calmer day. Maybe tomorrow morning. miles east of Tacoma and low winter sunshine cast a golden glow over the rusty cranes and ships on the nearby waterfront and even slipped in under the clouds now and then to illuminate the birds. I paddled and drifted around for several hours taking photographs and scanning the gull flock with binoculars. The longer I studied the gulls the less certain I became of my identifications, but I can say with certainty that the Black-tailed Gull wasn't around. with the camera, I was able to get some pretty good closeup shots, along with photos of a nearby Harbor Seal. 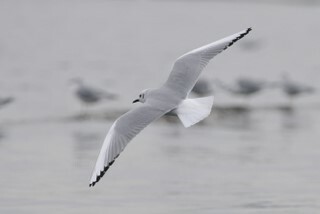 I also tried for a few gulls in flight - they're identifiable, if not particularly sharp. Light conditions were barely sufficient for ISO 500 without VR; only about one shot in ten was completely free of motion blur but I nonetheless kept probably a quarter of the photos I took. Drove up to Bothell for Adrian Call's Veteran's Day Half Marathon. He had a pretty good crowd including a number of Maniacs I haven't seen in a while - Monte, Prez, Ray, Marie, Jill, Francesca, Linda B, Mare P, and of course, Adrian. I ran hard despite never feeling particularly strong and was pretty sore afterwards in unexpected places - L knee, R glutes, mid-calves. Some irritation in the front of my lower L shin too, as usual. I finished in 6th place behind Prez and James Duggan (a relatively new Half Fanatic who ran a PR today). Ray's been doing speedwork and ran 1:50 and change today, close to a 6-minute PR. I ran with him for the first 5 miles at about an 8 minute pace so he must have slowed somewhat in the second half. I finished in 1:43:30 with an average HR of 172. My second half was almost 2 minutes faster than my first and it felt like it too; I couldn't quite maintain my pace for the last couple of miles. Based on my GPS the course was a bit short so for comparison with the halves I ran last month my time was probably close to 1:45. It was a beautiful run. Fog lay blue on the fields as we ran out to the turnaround and cottonwoods, washed clean by the rain overnight, lined the trail all tall and misty yellow in the morning sunshine during our run back to the finish. I listened to Deloris Claiborne by Stephen King on the drive up and back. The story is narrated entirely in the first person in a very authentic-sounding Maine accent with lots of local color. This was my second time through that book and it had me close to tears several times; I don't remember having such an emotional response the first time I listened to it. Definitely one to share with Susan and the boys on our next long trip together. get good bird photos. I had perhaps a dozen opportunities with the kinglets but in almost every photo the bird was facing away from me. I'd planned to take the canoe over to Commencement Bay to try for more gull photos but before packing up I called Shep since he told me last night that he'd be out in his boat again in the early afternoon. He was, and reported that there were only Bonaparte's and Mew Gulls and a few Californias on the log booms. The Black-tailed Gull, along with most of the California Gulls, has apparently left town. I was tired from a fairly strenuous 24-mile bike ride so decided not to go out this afternoon after all. I'm glad I got to see the gull before it left though I wish I'd been able to get a better view, and some photos. As it turned out Gary and I were the last to see it. for a while and talked to Gary down in California about our id of the Black-tailed Gull for a while then paddled over to Charlie's Marina and back to the gull flock where I photographed Bonaparte's gulls for a while before heading back in to shore. Gary was returning my call from earlier in the week. We agreed that it was the Black-tailed Gull that we saw, even though we weren't able to pick out all the field marks, based on the size, the gray mantle grading into dark wingtips, the yellowish legs and the extent of the black on the tail. Bonaparte's gulls made up most of the flock today, their numbers augmented around noon by many new arrivals from SE across the bay. They made the Mew Gulls look large and the Glaucous-winged, huge. Other birds included the raft of Barrow's Goldeneyes, a solitary American Wigeon, a couple Brandt's Cormorants and quite a few Double-crested, two Great Blue Herons, a few Black Turnstones and a small flock of Least Sandpipers. We watched David Eckblad get baptised this morning at the Wabash church. Their interim pastor seemed to claim in his sermon that by virtue of being baptised these young people were entering the portals of heaven and would (could?) now go out and save their communities. The candidates themselves each read a statement describing why they were choosing to be baptised. In virtually every case they had been raised in Christian families and first accepted Christ at a very young age, typically around 4 years old and were being baptised now that they had a more complete understanding of what it meant. Afterwards the Eckblad's hosted a number of friends for lunch. Nikki was delighted to see Susan, and Zack and I agreed to get back together for our morning Bible study and fellowship sometime soon. I filled a trash barrel with junk from the carport/workshop this morning, including the old manual mitre saw I bought at a yard sale a decade ago. For 10 years it has been taking up room on one shelf or another in the workshop. For 10 years every time I've noticed it I've felt a little pang of regret for buying it and not using it and keeping it around occupying up valuable shelf space. For 10 years I've been unable to throw out a useless but perfectly usable (except that the saw blade is dull) mitre saw. Well, 10 years is long enough; as of today it will trouble me no longer! While I was out we had a power outage which shut down my laptop and when I started it up again, PGP Desktop couldn't find my private keyring so I couldn't mount the encrypted disks on which I store financial and personal information. It took a while to find the keyring files and to figure out how to fix the problem - by overwriting the now-empty secret keying file with a backup copy, importing the keys from it then rebooting the laptop. It looks like the same thing may have happened last April but in the meantime I'd forgotten how to fix the problem and had to figure it out all over again. Well, note to self - check here for the solution next time. Once I got the laptop working again, I signed up for the Seattle marathon. For the third time in the last 7 years, and I haven't been able to run it yet. But this time I think I'll make it. Emptied the rain guage this morning - 5" since the beginning of the month, on top of 5" during the second half of October. That's a quarter of our annual rainfall in the past four weeks. I took advantage of the break in the weather today by driving over to Four Corners and running the Lake Wilderness and Cedar River trails, both gravel rail trails with a gentle gradient. From the start my left knee was a bit stiff and my calves a little tight from a fairly hard run late yesterday afternoon. I ran eight miles yesterday, three of them barefoot at a brisk pace. Though it was 42 and wet and the soles of my feet were half numb afterwards, it was worth it to run barefoot, my feet so light and quick. Today I ran at a more comfortable pace, around 10:00/mile, for 19.4 miles. I just watched the trail go by for the first eight miles then finished up Deloris Claiborne during miles 9-14 and listened to Chopin Etudes and Nocturnes for the last five miles. My knee stiffened up during the drive home and stayed pretty sore for an hour or two afterwards. My lower left shin, the usual trouble spot, didn't feel quite right during the second half of the run and afterwards but didn't become sore either. I wore the blue insole in my left shoe for more support, testing my theory that my shin problems are associated with excessive pronation in that foot. I think that arrangement will work for the marathon. Two noteworthy birds today, a Northern Shrike at the junction of SE 384th and 212th SE on the Auburn-Enumclaw plateau and a Peregrine Falcon circling over where Highway 18 crosses the Cedar River in Maple Valley, headed north. Nearly missed a fine symphony concert this evening; I didn't remember it until I logged into the computer after supper, just 20 minutes before we had to leave. Susan was already out so we met and left a car at the Costco parking lot. We weren't quite the last ones in before they closed the doors. Sumi Hahn in the Seattle Times online 11/20/09 described the concert better than I can. Spent most of the day investigating generator options, which range from about $1000 for a 6.5KW gas-powered portable to $7000 or more for a 17KW automatic standby generator powered by propane from a 500 gallon tank. Bruce from DSquared in North Bend came by to give us a bid on the latter option, their specialty. That might be overkill though, considering that we've lived here almost two decades and have never in all that time owned a functioning generator of any kind. I think there was one power outage where we lost some food in our freezers, perhaps $200 worth, and some of the fish in our fish tank died from the chill, and another time when I borrowed a 5KW generator from Pat for a few days which proved insufficient to power our well. Right now the most appealing option is an 8KW propane generator with a 120 gallon tank, which we might be able to get installed for $3500 or so, about the same price as a Honda 6500 watt gas-powered inverter generator. The propane setup is more trouble initially but would be considerably more convenient to use than gasoline. The boys came home for the evening. Somewhat after sunset I lit a fire in the fireplace because the living room was cold (about 62F). Seeing the fire, Susan suggested I call the boys up for worship. We haven't done that much recently but I agreed. When she didn't have any ideas as to what to read, I chose 2 Corinthians 5:17-21. No particular reason, other than it was only a few pages from where I'd left the little marking ribbon the last time I was reading my Bible. I've never particularly liked this passage. The verse which troubles me is 17: "Therefore, if anyone is in Christ he is a new creation; old things have passed away; behold, all things have become new." I've always understood things to refer to the character, the thoughts and desires and habits. In that view, the verse seems to say that when I am converted and living a new life in Christ, then my character is changed and my thoughts and desires no longer oppose God, but rather come into harmony with Him. Unfortunately that has not been my experience, and I have taken the persistence of "the old man", as Paul refers to it in Romans 6, to indicate that I am not in Christ after all. Because I didn't see much evidence that "all things have become new", I concluded that the Gospel "didn't work" in my case. And as to the rest of the passage, what incentive was there to go out and preach reconciliation if I that reconciliation didn't apply to me personally? This evening however, and for the first time, I saw this passage in a different light. The reference to things being changed for those who are in Christ now seemed to be saying that for those who have been reconciled to God, the rules are different. The paradigm has changed. Under the old rules, my behavior did count and it wasn't good enough. My continuing failure to measure up to His standards excluded me from His grace. But this verse says that the old rules don't apply. They've been replaced by a new arrangement between God and me through Christ. Under the new rules, I am reconciled to God through Jesus' death and established in God's grace through Jesus' life. That which was done by God's action ("God was in Christ reconciling the world to Himself, not imputing their trespasses to them" v19), is not undone by mine. Once I have been reconciled to God, my actions, whether good or bad, no longer affect my standing with Him. I read the passage aloud and talked briefly about it, something along the lines of what I've written here. I don't know if it struck a chord with the boys or not. Immersed as they are in the secular environment of college, they may not have much opportunity or inclination to consider spiritual things right now. Our boys were raised in a Christian home but perhaps with more ambivalence than David Eckblad and his fellow baptismal candidates last weekend. I haven't tried to hide my struggles from them, nor have we concealed our distrust of much of Christian culture and politics. Unfortunately in our distaste for the bathwater we may have discarded the baby, with regard to our influence on their life with God. On a cheerier note, I completed our 2009 Christmas Letter this evening, first a print version then this online edition. Susan liked the layout but found the content a little boring. I can see her point; our lives wouldn't make for very interesting reality TV, but on the other hand things certainly could be worse. Spent most of the day at the computer, revising the format of my Journal pages as well as some of the other brianpen.com pages. In the new format, the page content is framed by a thin gold border and floats in a field of dark gray. Passing parameter "print=Y" in the query string removes the heading, frame and breadcrumb links for printing. At dusk this evening I stepped out of the workshop for a moment just as the Great-horned Owl flew over, flapping stiffly, steadily, silently less than 30 feet overhead. We've been hearing it call in the night for a couple of months but this was the first time I've seen it. I don't know what I did yesterday, but today I put up an online version of our 2008 Christmas letter, something I never got around to doing last year. I made an image map for the collage so each image in the collage links to either a larger version of the shot, or a photo gallery, or a journal entry. It's pretty cool. Little by little I'm learning more HTML and CSS, which is also cool. This afternoon I drove over to Tacoma and picked up Daniel, then we took the canoe out on Commencement Bay below Old Town. We paddled NE past the pair of big gray ships moored east of town then W over to "GI Shenanigans" restaurant along Ruston Way west of Old Town. It was misty and quiet when we set out but a bit of a breeze came up and cleared the air somewhat by sunset, revealing some color off to the southwest and a hint of a rainbow over the bay. After supper I baked the last piece of my 2008 salmon. It came out remarkably well (baked w/ onion, capers and red wine) considering how long it has been sitting in the freezer. White wine, or perhaps no wine, would have been better; the red is a little strong for fish. I fixed our Internet again this morning. Being out of range of both Cable and DSL we depend for internet access on a chain of points of failure consisting of a transmitter on top of a peak north of Mt Rainier, a relay antenna on the corner of the roof of a house at the end of our street, a dish antenna nailed to the several trunks of a 40' tall Western White Pine out in our field and a 300' run of CAT5 cable from the dish in the pine down to and across the field past the garden gate to the driveway fence where it is coupled to another run of CAT5 cable under the driveway and up through a hole our living room wall to the router on top of the bookcase. Unfortunately nature, in the form of two cottonwoods and a young Douglas fir on the property of an irascible neighbor down the street, is steadily encroaching on the tenuous connection between the relay station and our dish. On dry days the signal gets through clearly but rain and wind can confuse it and drizzle seems to disrupt it entirely. My theory is that the signal can evade small twigs and branches but cannot penetrate the water which during calm drizzly conditions such as this evening collects in the form of a droplet on each and every needle of that Douglas Fir. A couple of days ago our Internet quit entirely so I climbed the pine, which this time of year is coated with a seasonal skin of crumbly slimy green algae, and discovered that the windstorm earlier this week had pulled the dish bracket (an old piece of 2x6 lumber) free from trunk #3 so the dish was facing east towards the street rather than south towards the source of the signal. I reattached the 2x6 and for good measure tied the dish into position with baling twine. After my repair our signal was as strong as I've ever measured it (4500 download and 1350 upload at Speakeasy). After I got the internet working I went out for a run and did 8.3 miles barefoot, my longest barefoot run ever, from BV back to the Grange with side trips up 176th and down 180th. Rough chipseal in the second mile left my feet pretty tender but by mile 3 I found smoother pavement and the feet recovered. Afterwards they were a little sore, particularly around the outer edges of my heels, an area which seems to be aggravated by running downhill. In the afternoon I drove over to get the boys, stopping at Great Harvest for bread then at the NE 5000 pullout to take the canoe out on the bay again. I wanted to try alternating side paddling instead of paddling just on one side with a pry stroke to maintain my heading. I found that by paddling 3 or 4 strokes at a time on each side I could move over the water perhaps 50% faster than with my pry stroke. Switching sides was a little cumbersome at first but became easier, and I can see that it would become pretty much automatic with practice. The trick is to switch just before the stern begins to drag sideways in the water. Depending on the wind direction that could be as soon as 2 strokes or as long as 5 or 6. I also tried sitting on the bow seat facing the stern - easier on the knees than my usual position kneeling just in front of the center thwart but I can put more power into my strokes kneeling than I can sitting. The kneeling position is more stable too, a significant benefit considering the serious adverse consequences of capsizing offshore in 50F water. I'm thinking I ought to ask for a dry suit for Christmas. Susan spent all day Thursday in the kitchen fixing a delicious dinner and a very large apple pie. David worked on his architecture paper about Tacoma's Union Station and Daniel spent most of the day on his laptop as well. Cody came over in the evening and we ate dinner in the living room in front of the fireplace, though it was too warm for a fire. I left the house around 6:30AM and found parking along Westlake Ave about a mile from the start. I exited at Madison and took Boren down to Denny, then failed to get off Denny soon enough so ended up sitting in traffic for an extra 10 minutes. Next time it would be better to turn left onto Westlake, and perhaps also spring for the extra $5 to park in a lot near the start. I reached the starting area about a half hour before the 8:15AM start and right away ran into Tony and his friend Lori #1700 whose last name I never quite caught, though I ended up running with her on and off for most of the race. I found a few more Maniacs over by the bag drop, then wandered over to the long lines of nearly unoccupied Porta Potties by EMP. Interesting photo compositions. Lori and I caught up to Barefoot Todd #210 around mile 5 on the I-90 floating bridge. I slowed down to run with him for awhile. He greeted me like an old friend though I don't think he quite remembered where he'd run across me before, and though I said my name I forgot to mention that we'd met previously at the Tahoe Triple. We talked about barefoot running, of course. I ran back across the bridge with Jim Boyd, a particularly friendly Maniac who's a big fan of our races, and with whom I always enjoy running and visiting. Once I got off the freeway at mile 8 I didn't take any more pictures, to my regret since Seattle is such a scenic course. I caught up to Lori again somewhere south of the bridge, then continued on ahead intending to catch Marilou #285 with whom we'd started out. I caught up to her and David Hamilton #505 at the start of the loop around Seward Park. and took off my shoes. That was about mile 12 and I made it to mile 18 before the rough road began to be too much for my tender feet. Around mile 16 I passed my inspiration Barefoot Jon #209 who was delightfully excited to see me running barefoot, and a little while later met Jill #535. I found Monte #438 around mile 18 and ran with him for a few minutes. He's slowed down since ankle surgery last April and his ankle is still bothering him though he's run 11 marathons since June nonetheless. Somewhere around mile 20, shortly before the Galer hill, I met up with Larry Macon #120 and walked with him for the next half hour. He's on his 90'th this year, #598 lifetime. He told me he works 80 hours a week as a trial lawyer in Texas so isn't able to run as many marathons as he'd like. I told him what I've been doing and he observed that I have alot of hobbies. After all that walking I'd gotten stiff but loosened up as I ran through the woods up the Interlaken hill, one of my favorite parts of the course. I caught up to Lori again at mile 24 where Boylston crosses under the freeway. Before I drifted ahead on the downhill over the freeway I told her we were on track for 4:22 but I was a couple minutes too optimistic. I finished in 4:23:11 feeling very good considering I haven't run one in a while, basically just stiff from the waist down and that loosened up with a little stretching.